ELRIG’s flagship event, Drug Discovery, is now in its 12th year and has become the largest meeting of life science industry professionals in the UK. Featuring a panel of over 50 world-class speakers covering the hottest topics and ground-breaking innovations in the field, Drug Discovery 2018 is an event that you can’t afford to miss. The conference will take place at the ExCeL Arena in London on the 9th and 10th October for what promises to be its most exciting year yet. For the first time, delegates will be able to attend free training sessions on the latest, breakthrough scientific techniques and workshops that include practical aspects of working with cutting-edge technologies. Early career professionals will also find a wealth of information through CV workshops, “meet the mentor” and “learn from your peers” sessions. Drug Discovery 2018 will bring together a diverse group of around 1,200 delegates from researchers to government officials and investors from across the life science sector, to stimulate discussions on pertinent challenges and future opportunities in the discovery and development of novel therapeutics. If you are involved in drug discovery or disease research in any way, read on to find out ten reasons why you cannot afford to miss Drug Discovery 2018 in London on October 9th. Yes, that’s right! Drug Discovery 2018 is completely free for delegates to attend – even lunch is provided! Register today and join a wealth of industry leaders and academic experts, without having to spend a penny on registration fees. What’s more, all workshops, training sessions and talks are included with your entrance pass, you won’t find any hidden costs. You can also present a poster about your research free of charge by submitting an abstract for review by the meeting’s Scientific Program Committee. Although the event is free to attend, the quality of the science on show will be of the very highest order. The Drug Discovery 2018 programme is jam-packed with over 50 world-class speakers, including the Plenary keynotes, Prof. Janet Thornton (Senior Research Scientist, European Bioinformatics Institute) and Jonathan Milner (Co-founder and Deputy Chairman, Abcam). With talks spread across eight distinct conference tracks, you’ll hear thought-leaders and experts speak on current issues and opportunities, helping you to generate new ideas to drive your research forward. New for Drug Discovery 2018 are the Learning Paths; follow these suggested agendas to get the lowdown on the topics you’re interested in. Drug Discovery 2018 gives you the chance to attend interactive workshops on new technologies and techniques, industry issues and trends, as well as check out talks and posters on the latest research. With over 100 exhibitors on hand to show you the hottest technologies and service solutions, you’ll no doubt pick up a few tips to help you achieve your research goals. This year, the Drug Discovery event also boasts the Innovation Zone Trail, featuring a diverse range of emerging companies offering innovative and exciting technologies and services. It’s expected that around 1,200 drug discovery practitioners will attend Drug Discovery 2018, with delegates coming from all sectors of the drug discovery community. Attendance figures from previous years reveal that over 40% of attendees come from biopharma, while more than 30% are from academia and just under 30% work in other domains, including investment firms, government agencies and the media. This year, ELRIG has partnered with the BPS to further strengthen the links between academia and the biopharmaceutical industry. The partnership will see the BPS delivering one of the key conference tracks, while also attracting delegates from the BPS extensive member network. With such a diverse group of attendees, Drug Discovery 2018 provides the ideal chance to find out how your research could be applicable in other sectors, and how novel approaches and breakthroughs in other fields could help you with your work. Tapping into this breadth of knowledge could drive innovation within your research, help you achieve your commercial goals, or even lead to your next career opportunity. Drug Discovery 2018 gives you the opportunity to engage with other delegates, key opinion leaders and speakers to enhance your skills and knowledge, both within and outside your usual field. The free-to-attend workshops at Drug Discovery 2018 are also fantastic training tools for you to learn about the latest technologies, how to use them, and how they can enhance your research. For example, BioHub is giving free taster sessions on how to get the most from CRISPR and organoids, and workshops featuring sessions led by Peak Analysis and Automation Ltd, SiLa, Sartorius Stedim Biotech, Titian Software and others will give you the chance to learn about cutting-edge ideas and technologies that are set to impact the future of the laboratory environment. There are also workshops aimed at Early Career Professionals to help understand the wide array of opportunities and career paths beyond academia. Whether you’re a post-doc, postgraduate, or early career researcher, Drug Discovery 2018 offers an unrivalled opportunity to get the insight you need to shape your own future. With “Meet the Mentor” and “Learn from your Peers” panel sessions, as well as CV workshops, Drug Discovery 2018 is the ideal forum to get your career questions answered and obtain the expert guidance you need to realise your ambitions. And with two full days of meeting new people that share similar research interests, as well as the chance to make new connections with individuals in other sectors, you never know where your next encounter might take you! Successfully translating research to the clinic is the ultimate aim of scientists working in drug discovery world-wide. More than ever before, academic researchers are collaborating with pharma companies to fully leverage their scientific breakthroughs in ways that open up new clinical potential. At Drug Discovery 2018, industry representatives and researchers will be on hand to discuss opportunities for converting primary research into new treatments for disease. Collaborations such as these have the potential to improve the lives of patients, as well as help all involved make their research more translatable (something that could also make it easier to publish in higher-impact journals). Looking for a contract research organisation, but don’t know where to begin? 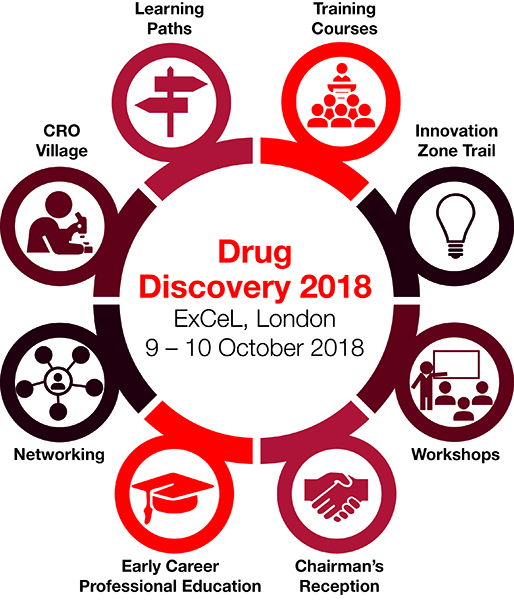 Kick start your search at Drug Discovery 2018’s dedicated CRO exhibition village. CROs now offer an increasing range of services and capabilities, with more industry and academic expertise than ever before. With representatives from across the contract research sector, the CRO village will help you find out what these organisations can offer and give you an unparalleled opportunity to make face-to-face connections with the CROs that could unlock the commercial potential in your research. ELRIG has a wealth of knowledge in organising events, running various conferences and shows each year across Europe. And now in its 12th year, Drug Discovery 2018 has been developed over a decade to make sure attendees get real value from attending, and experience a seamlessly organised event, so you can get the most out of your time at the show. The world-class conference centre at London’s ExCeL Arena will only add to your enjoyment. The venue is located beside the Royal Victoria Dock at the heart of London’s Docklands district, just a stone’s throw from London’s historic Royal Borough of Greenwich and the O2 Arena. With attendee experience at the front of mind, the organisers are already making life easier for delegates: you can quickly get information about Drug Discovery 2018 on your mobile by downloading the ELRIG app. Alternatively, visit the ELRIG website for an interactive event programme. You can also follow the conversation before and during the show by using the hashtag #ELRIGDD18 on Twitter. If you would like to learn more about the event and register for free, you can find more information about Drug Discovery 2018 and register here.